These areas of pain often occur within and around muscle. Trigger points and myofascial pain in the legs can also contribute to what we often refer to as the "lumps and bumps" in fibromyalgia. I have yet to meet someone with fibromyalgia that has merely a POINT of pain or tenderness. (However, both tender points and widespread pain areas are still used for diagnosis) And because tender points differ from trigger points, refer also to the 'trigger points' article for a more in depth discussion on TRP's in fibromyalgia. Now most people with fibro describe an "area" of pain that radiates to the surrounding tendons or trigger points. Often there is an involvement with an associated tendon, ligament or TRP (trigger point). This is what causes the pain to radiate or extend. What else can exacerbate fibromyalgia leg pain? Trigger points, inactivity, loss of muscle mass, lower back pain, sciatica, SI joint involvement, certain medications, cold/flu and more. The interesting thing about fibromyalgia related leg pain is that it doesn't matter whether you are standing, sitting or lying down. 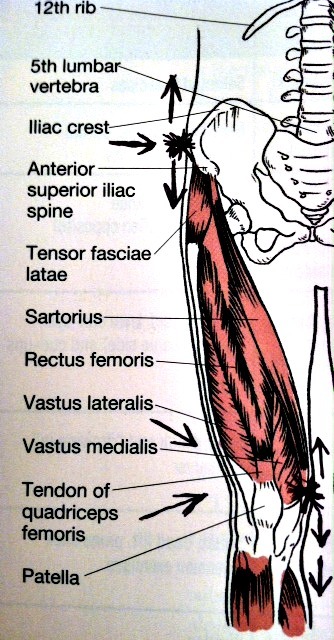 Agility can be lost and these "areas" of interest become wider still (as shown in the adjacent graphic), with the tender point pain spreading both above and below the actual point location on the inside of the knee. I had to start thinking outside of the box and this is when I set out to create fibro specific exercises and start working with my fibromyalgia leg pain in a way that I had not previously done. This doesn’t mean that we can "cure" ALL pain through conditioning of the body, but when strength and agility are lost, everything suffers. So now we must look at what will counteract this phenomena that has become so common in fibro today. It is important to know that it’s the everyday activities that can be detrimental to a fibro body and not the conditioning through safe and effective exercise. There are some activities of daily living such as cleaning a bathtub or lifting heavy objects improperly that really can be detrimental to a fibro body, where as focused fitness training actually 'protects' the body and builds a stronger resilience and foundation. It can be helpful to experiment with light "rolling" on a foam roller OR working with a therapist who is experienced in myofascial release. It does not always have to be extremely painful to ‘work’ these areas, but there is benefit in learning how to work with these affected points/areas in a way that is healing, not detrimental to the fibro body. You can read some of my suggestions here at Myofascial Release. Another helpful Rx is using compression wear on the legs and knees whenever needed, even before and after exercise. We have been experimenting with various types of compression over the past few years, using compression socks, sleeves and also making our own by cutting up old socks and other pieces of material to find what works best at various rates of compression. This can increase circulation, soothe "tender" tendons and ease pain in the affected areas. I have recently experimented with a particular type of pressure point therapy that provides considerable relief. It is the Nature's Pillows "BeActive" brace. 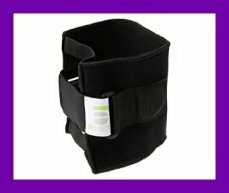 I like to wear it at night and sometimes through the night, I find that I really do have less lower back and leg pain in the mornings. And because tender points are different from trigger points (TRPs) in the leg region, refer to the page/article on TRIGGER POINTS here on the site. Also, if you did not get here by way of my Facebook fitness page, you might want to take a look at the Fibro Fit People fitness page to get even more support. As a trainer who lives and works out with fibro, I get it!